Solo: A Star Wars Story #4 kicks off the action for Marvel’s comic adaptation of last year’s film. It’s another issue jam-packed with dialogue that doesn’t benefit as much as the last issue’s set-up episode did. Finally on the Falcon, we begin with the quiet interlude before the literal storms in space around Kessel. It’s an important moment in the film, raising stakes after Dryden’s ultimatum and building tension before this crew’s first real test. As the introductory act in a comic book, it feels like filler. The downfall of this series — in every issue — has been the need to painstakingly transcribe every single scene of the movie. Because of this, the thing is so rushed and bloated that it couldn’t hope for any resonance in a quiet scene filled with character moments. (It would be better served with an original scene to supplement that which we’ve already seen in the movie.) Skip it. Get it over with and get to the action. And the action is what Solo #4 is good at. Free of the weight of transcribing a lengthy scene with no real motion, the writer and artists seem to relish the heist that follows in the second-half. Certainly more than they did the lifeless train heist from Solo #2. Here the action balances as well as it ever has with the ever-wordy script and omnipresent array of word balloons in each panel. The art is in top form for the chaos of conflict this week. There’s still plenty that doesn’t work — Beckett’s floating head is unlike anything that’s appeared in this series so far — but the detail seems to have returned in this issue. In particular, the recurring borderless “establishing shot” panels that top several of the pages provide some of the most attractive artwork of the series. 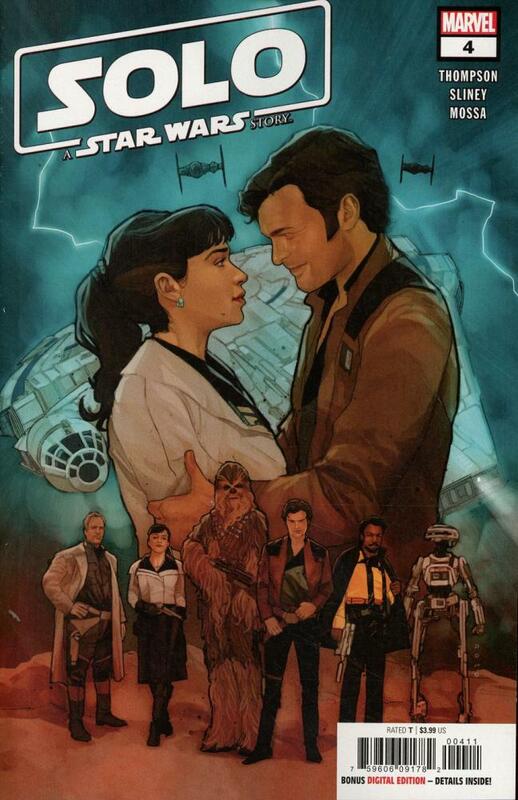 Solo: A Star Wars Story #4 isn’t as consistent as the previous issue, but they both show a possible turnaround for the series that may carry through the finale. It’s not outstanding and it still fails to achieve anything beyond retreading the movie, but there’s promise here that was absent in the early issues.